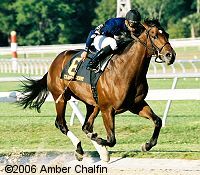 Note: Broke his maiden first out at Saratoga, but then had 3 poor performances before shipping to Tampa where he was 2nd in the Sam F. Davis behind Bluegrass Cat. Turned the tables on that rival in the Tampa Day Derby, winning by 2 lengths. Shipped to New York for the Wood but again had a poor performance over a sloppy track, finishing 6th. Never really a factor in the Derby, he was 11 wide on the final turn and finished 8th.